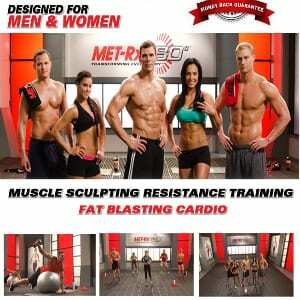 Can the Met-RX 180 Workout Program Really Deliver Results in 90 Days? Does MET-Rx 180 Really Work? MET-Rx 180 is a workout program that is broken down into three distinct phases so your body can get used to the idea of exercising and working out. It’s brought to you by MET-Rx, which you may be familiar with if you’ve seen some of their products in health and fitness stores for muscle building. But have they developed a fitness system that actually works? There’s no shortage of programs out there promising to be able to take you from fat to fit, so it can be hard determining which to go with. It really comes down to picking one that feels right to you and one that you think you could stick with over the long term. A lot of them ask you to block off 90 days and go all out during that period, and this one is no different. The 180 represents the turnaround that your body is supposed to do by following the system. Fitness programs always have some hype, because there is a cookie-cutter nature to them. It seems that all you have to do is find a fitness model to be the host, put together a series of exercises, toss a meal plan around it, and voilà, you’ve got a product. Then it just comes down to promoting it correctly, make an infomercial, get some testimonials and you start making sales. The total cost of MET-Rx 180 is $145, which includes shipping, and they give you the choice of whether you want to pay it all up front, or be billed for it in monthly installments. They’ve got it covered by a 90 day warranty which means you can come close to completing the entire program and fully evaluate it before making your final purchasing decision. When considering the cost, also consider that you’re getting several items and not just the DVDs. Similar programs cost about as much and only include the DVD workouts and maybe a wall calendar. This comes with a ball and a pump, a resistance band, the DVDs of course, measuring tools to track your real progress, and an online community so you can get and give support to other members. It’s a pretty comprehensive package and we feel they’ve justified the price point. Like any fitness program you’re going to have to get serious about following this. You should pick a 90 day period where you don’t have a lot of things going on in your life that would make it difficult to stick to an exercise regimen and eating program. This means you want to avoid scheduling it when you’ve got travel lined up, or over the holidays, or at times when you know it’s not going to be convenient for you to work out and watch what you eat. The MET-Rx 180 is well thought out, splitting it up into three 30 day phases. This makes it easier to get your head around, because 30 days isn’t very long, and if you just focus on the current phase you’re in you won’t get overwhelmed by what’s to come. Also, 90 day workout programs that aren’t broken down into phases like this might seem to get a little boring halfway through, since you’ve been doing roughly the same thing for the last 40, 50, 60 or more days in a row. The lure to home fitness programs is that you don’t have to get a gym membership, and you don’t have to work out in front of other people in order to get in shape. This is a big draw if you’re out of shape and don’t want people to see you struggle to lift weights in the beginning. These programs make great catalysts to get you into a fitness mindset and potentially get you into the gym once you’ve completed it and have a brand new body to show for it. MET-Rx 180 is getting a Solid Try rating from us, based on what you’re getting with the starter kit, the positive feedback from those that have tried it out, and the fact that it’s all backed by a money back guarantee. The interesting thing about these sort of programs is that you get what you put in, so if you work it you’ll see results, and if you tuck it away in a closet you won’t. The nice part is that you’re given everything you need to get started and see results, and you can then decide if you want to upgrade to higher weights as you progress. 90 day workout programs are pretty good to go with because they’re asking for a lot, but not too much. If you’re serious about taking a stand on your health and fitness, 90 days is a reasonable amount of time to spend getting yourself there. Just remember that you can always regress, and even when the 90 days is up you’ve got to stick to what you’ve learned and maintain the results you’ve achieved. What do you think? Does MET-Rx 180 work or not? I stumbled upon your website and thought I would throw my 2 cents in. I was in the testimonial group at the beginning of 2012. I’m the first man in the “before & after” photos on the Met-RX website. I volunteered for the program and it definitely worked for me! Yes, you get out what you put into it, but Met-Rx 180 was the first program that took me all the way to my goals. I’ve bought & failed at a few other programs (ie. “extreme …”, “P90..”) and they just were too hard to keep up with! I know I probably sound like a paid actor, but my results were very real. (238lbs to 200lbs; size 38+ waist to 32). I’m still keeping the weight & inches off by using the program a few times per wk and it’s been 8 months now. I was skeptical at first, but now I’m a true believer! Rick C.
I tried met-rx last year and after that program was in the best shape of my life. I bought the program on amazon. Would you Happen to know what happened to the program? Why didn’t it make it? Do you know if there’s any chance of it coming back? Yes, Yes, Yes!!! The Met-Rx 180 plan works. Plain and simple. I had reached a plateau and stayed there for about a year. One week after trying the Met-Rx 180 program and the scale started going down and so did the inches. In 90 days I lost 31 lbs and 32.5 inches. I am still losing and very pleased with the transformation Met-Rx 180 has given me. No other program gave me such great results. The DVDs are very detailed and you can follow along with schedule quite easily because there is a calendar that tells you each workout for each day of the week. Frank’s motivation is priceless. You will feel an increase in energy as the pounds melt away. All you have to do is change your mind and you will change your life with Met-Rx 180. Do you have workout schedule “Met-RX 180” in .pdf or document? You know what they never make a big deal of with these programmes? The diet. They always tag them on a some kind of extra at the end. The reason they don’t make the diet an integral part of the advertisement of this product, is that diet is actually WAY MORE important than how you train if you want to look like the fitness models they have in the videos. The reason they don’t make a big deal of this is because eating right takes up ALL OF YOUR TIME AND ENERGY. Training, even in this high intensity way is easy in comparison to not cheating on your diet. Tried other 90 systems including the reknown P90X. Metrx 180 is the ONLY program I finished. I am on my 3rd cycle.